When you have as cool a name as Visual Goodness, you want to create news with it, spread it around, design a product that can be shared with clients while promoting your company’s vision. Edward Cox, co-founder of VisualGoodness.com, has teamed up with Towelhoodies to create a gift for clients to say thank you. Taking their business logo, digitizing it for embroidery, pairing it with one of our classic solid ribbons, we’ve created a unique business promotional gift. 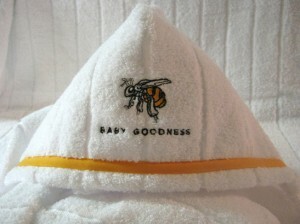 Towelhoodies.com offers a variety of ribbons that can creatively combine with your business logo to make a lasting impression.